The center of the Lustre development world is a code branch that goes by the name of “master”. 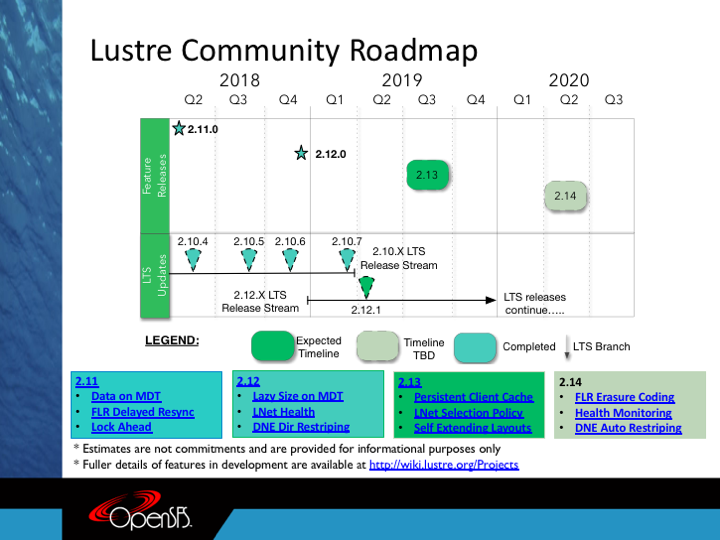 The master development branch is the central location where all organizations in the Lustre open source community submit changes for review and inclusion into the main Lustre product. The community plans to create a major release along the master branch approximately every six months. Lustre is a vibrant Open Source project with many organizations working on new features and improvements in parallel. We coordinate those efforts primarily through OpenSFS and EOFS. Meeting development target dates is a difficult task for any software project, but doubly so in a globally distributed Open Source project. We provide target dates for features where the development has demonstrated strong progress and maintained open communication with the community. However, it should be understood that the listed target dates are just an estimate, and no guarantee that the feature will appear in any particular release. Please see the Development wiki page for information about Lustre development activities. Brought to you by OpenSFS and EOFS. Lustre is a registered trademark of Seagate Technology LLC in the United States.